Quality 33 cm Crystal Ruler carrying your advertising message. Price includes printing the graduation and your message in the same one colour of your choice. Origination £35. 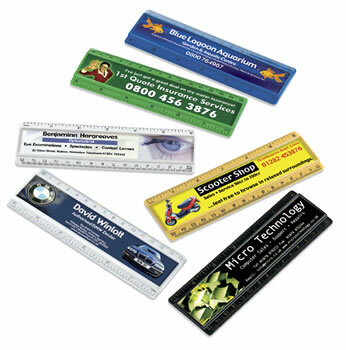 Please contact us for prices and personalisation options utilising more than one colour. 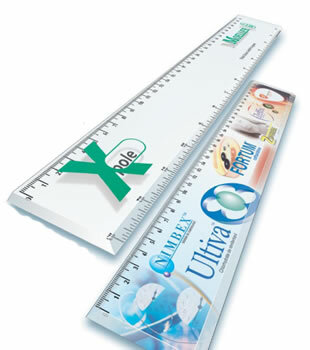 20 cm Ruler featuring a horizontal magnifier in its centre. Economical solid 6 inch (15cm) ruler. Available clear and in a range of colours. Print area: 135 x 18 mm. Price includes one colour print one one side and origination. 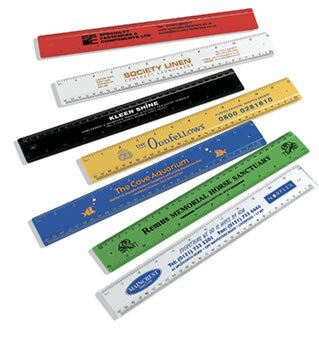 The coloured rulers are also available using recycled materials. Please contact us for price details. 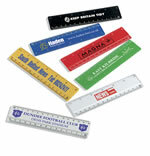 A practical promotional product with great customer usage. There is a wide colour choice, including clear on this economical giveaway. Print area: 280 x 20 mm. 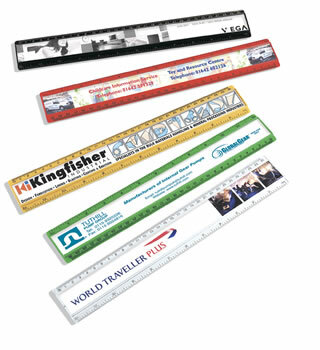 Versatile 6 inch (15cm) ruler with large print area. Available in a wide range of colours including clear. 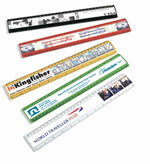 Large printable areas in these 12 inch (30 cm) top quality rulers. Available in a range of colours including clear. Print area: 310 x 49 mm. Ideal for promoting your company website. 22 cm scale. Available in white. Size: 29.8 x 3.4 x 0.2 cm.